Our largest room with double bed, large ensuite shower room and WC. 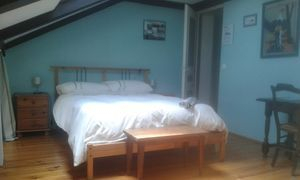 Slightly smaller double room with shower and WC. Twin room with ensuite shower and WC. Please note restricted headroom in this room. Viella Vacances rent as a Gite! Viella Vacances is delighted to offer our guests the opportunity to rent the three bedrooms, guest lounge and kitchenette as a whole unit (3 bedroomed gîte). There is a fully equipped kitchen and washing machine, lounge with TV (french television), DVD player, pool table and plenty of games. Together, they make a superb apartment. All rooms are centrally heated, so the apartment is ideal for out of season breaks. Downstairs there is a large dinning room with woodburner which turns into an indoor grill. It has its own entrance and there is the large shared garden to enjoy. It accommodates up to 7 people with ease. Special offers available for weekends. Contact us for details. Price includes bed linen, towels and a welcome pack of tea/ coffee, milk and bread etc. Cleaning at the end of your stay is not included in the price. This can be added at a cost of 40€. N.B The gîte cannot be booked if there are any bookings for the Chambres d'hôtes in the same week. Bookings are not confirmed until receipt of the deposit. Book a Room Direct - no fees !